Alastair Macaulay,the NY Times dance critic who's retiring this year, often gives talks at the library. On Monday at 6pm, he's presenting a program on Merce Cunningham. 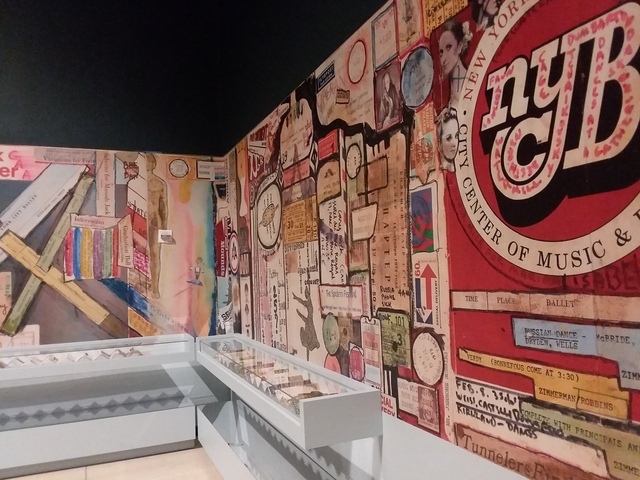 Those who claim New York to be the world’s dance capital have few grounds better than the dance division of the New York Public Library for the Performing Arts: the largest, most eclectic, and most enterprising collection of dance materials anywhere. It regularly films dance productions in the city, preserving the present for the future; it aims to have a copy of every dance book ever published; it possesses treasures going back centuries. And its doors are open to the public as well as to specialist researchers. For many dance devotees who live elsewhere, a visit to New York has to include time on the third floor of that library, located at Lincoln Center, to view its dance films. Visiting from Britain in the 1970s and ’80s, I learned much about British dance that was unknown back home. Find a screen, enter the online catalog, click a link, and within a minute or two you can find yourself watching Merce Cunningham and his company performing “Antic Meet” in 1964. Curious how Balanchine’s “Serenade” looked when it was danced in skirts ending at the knee? Here are clips of the Ballet Russe de Monte Carlo’s 1940 and ’44 performances. Want to know how Margot Fonteyn looked in “Sleeping Beauty” when the Sadler’s Wells Ballet toured North America in the 1950s? Here she is, in all three acts. Today the dance division contains the collections of Mikhail Baryshnikov, Merce Cunningham and Jerome Robbins, among many more. Its full name is the Jerome Robbins Dance Division, and with good reason: The choreographer donated a share of all the royalties of his “Fiddler on the Roof” to it. This year, the dance division celebrates its 75th anniversary. I’ve been visiting it for 40 years; revelations occur there frequently. I made many more discoveries recently, when Linda Murray, the collection’s curator, gave me a tour of some of its rarer treasures, demonstrating its breadth and depth. Here we show just a few selections. Ballet shoes can be mere items of fan fetishism. The dance division, however, has a number of dance shoes that are historically telling. Anna Pavlova’s feet were famously arched and tapered, yet her shoes have much less pronounced blocks for the toes than any modern ballerina would employ. She was the most world-renowned ballerina with the most world-renowned feet — but her shoes make us marvel at the strength those slender feet must have had. (This pair is thought to have been made in the 1920s, a decade when she traveled the globe.) They also have a remarkable amount of side stitching. We can only speculate what support this gave her. Ballet has its roots in the Italian Renaissance, particularly in the work of the dancing masters of the 15th and 16th centuries who established principles of harmony in dance terms. The library’s copy of one of the earliest and most influential dance manuals, “De Pratica Seu Arte Tripudii” (“On the Practice or Art of Dancing”), is dated 1453: The author is Guglielmo Ebreo (William the Jew — “Ebreo” means Hebrew) from Pesaro; his treatise is seminal, an indication of Renaissance thought governing dance to give it both rules and harmony. I’ve been reading secondhand about this sourcebook for years: I never expected to see an original copy, or to find that it was handwritten. The language is at first impenetrable, but the word “Danza” (dance), at the top of one page, is the beginning that leads the scholar into its teachings. In 1919, at 30, the already legendary dancer-choreographer Vaslav Nijinsky (1889-1950) was found to have schizophrenia; he remained in one institution or another for the rest of his life. During the early days of his illness he wrote a remarkable diary that became celebrated when his wife, Romola, published a bowdlerized version of it in English in 1936. (In 1999, an unexpurgated version, edited by the critic Joan Acocella, was published.) The original is now in the library. Nijinsky’s mind wanders in many directions, but a recurring theme is God, with whom Nijinsky at times identifies. Nijinsky’s drawings show striking firmness of contour and force of color; several suggest, as his wife said he intended, eyes. In the context of his writings, it is easy to imagine them as the eye of God. The American dance critic Edwin Denby wrote in 1944 that modernism had reached its most radical extreme in the work of Nijinsky and his German contemporary, the dancer-choreographer Mary Wigman (1886-1973). Martha Graham, only a few years younger, was inspired in the 1920s by what she heard of Wigman. When Wigman finally toured the United States in 1930, Graham burst into tears of relief when she found that her own work had not been a mere reproduction of Wigman’s after all. Wigman left a pictorial diary of her visit to America, seen here. In its pages she seems jollier than her dance reputation suggests, but with a talent for mordant satire. From the first, the library’s dance collection included non-Western dance forms. Though there are few films of Southeast Asian dance before the 1960s, here is a 1933 one of a Balinese dancer, bare-breasted, not performing a formal dance but demonstrating the exercise technique for the idiom. The film goes on to record various ceremonial dances from Bali and Borneo. You can find films of Bedhaya, the Javanese court dance genre; a 1966 festival of dances from 13 West African countries in Senegal; Cambodian dance performed at Angkor Wat; boys training in Kathakali, the Indian classical form whose multilayered makeup alone takes hours to apply; and multiple examples of whirling dervishes and Egyptian belly dancing. As I type this in the library, I’m watching a 40-minute color documentary about Mongolian dance, filmed in the open air with mountains on every horizon. One man’s rhythmic isolations of alternate shoulders are fabulously huge — and cause his colleagues to grin from ear to ear. George Balanchine and Lincoln Kirstein opened the School of American Ballet in 1934, and soon afterward a professional company, the American Ballet (a precursor of New York City Ballet). Kirstein worked to devise ballets that would be American and labored for many months with Balanchine on an adaptation of Harriet Beecher Stowe’s novel “Uncle Tom’s Cabin.” Here is “Tom,” the pictorial libretto he commissioned from the American poet-dramatist E.E. Cummings, with illustrations by Ben Shahn. The score was to have been by Virgil Thomson, the composer of the avant-garde opera “Four Saints in Three Acts” (1934, performed by an African-American cast). Kirstein’s handwritten diaries — also kept by the dance division and often consulted by scholars — record many discussions and plans for “Tom” with Balanchine, Cummings and Thomson, though separately. Nonetheless no “Tom” ballet ever materialized; it remains one of history’s intriguing might-have-beens. Today the dance division contains the collections of Mikhail Baryshnikov, Merce Cunningham and Jerome Robbins, among many more.